Technology is full of promise. And we like our technology and we like hopeful promises of an ideal future. Often however it seems to be long on promise and short on delivery. 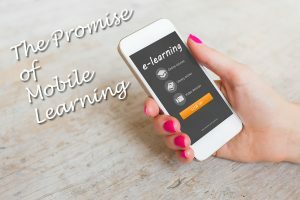 For many years, mobile learning was one of those promises. There is the story about a woman who signed up for an online dating service and got paired with a software developer. They never actually went on a date, the developer just kept telling her how good the date was going to be. Once mobile devices started to become popular the promise of being able to have everything on our devices, including learning programs, was right on the heels. And it began to feel like that old joke. Now, thanks to new learning standards, and new ways of using older ones, that promise may be here. The big challenge is answering the question, “Does learning occur if no one recorded it?” For many years, with the use of SCORM alone, the answer was no. SCORM had the limitation that any learning you wanted recorded had to be eLearning (formal learning), online, launched in a browser from a LMS, and could only record very specific things. In addition, the eLearning itself was designed for the computer screen. Therefore, any informal learning that occurred was not recordable and according to the LMS did not happen. Read a textbook on a specific topic? Had an on-the-job training experience? Not as far as the LMS is concerned. Obviously, as technology developed that would not do. With a wider variety of ways we could deliver learning experiences, combined with the desire to support and track performance, things had to change. We had to find ways to overcome SCORM’s limitations and open up the channels to recording a wide variety of learning experiences. To that end came the development of HTML5 and responsive web content that adjusts to the screen size. Then came Experience API (xAPI) and CMI5. Along with that, several creative people found innovative ways to still utilize SCORM even in mobile environments. So the promise of mobile learning may be closer than you may think. Let’s look at how we can use our standards for learning in the mobile world. The first challenge that a mobile device presents is the smaller screen. That creates a problem for SCORM right there in that most eLearning content was made for the bigger displays of desktop and laptop computers. However, most authoring software now has the ability to develop content that will adjust according to screen size. And more recent LMS’s have the ability to deliver responsive content; that is, content that adjusts to the learner’s system for display. What about Flash? A lot of eLearning content is at least partially Flash-based and famously mobile devices have shunned the playing of Flash content. But they have been able to afford to do that because of the features of HTML5, many of which make the Flash player obsolete. In addition, most of the authoring tools that produced Flash content, like Captivate and Storyline, now produce HTML5 content as an alternative. One of the big challenges is that you can’t always depend on mobile devices having continuous internet connection. That could lead to some SCORM tracking issues. Many mobile-compatible LMS’s are overcoming this by creating native application versions of their LMS interface. It would have to be installed on the mobile device but would allow for offline work. The only challenge would be having to create an app for each mobile platform. Using xAPI for mobile learning gives you some options. First, it doesn’t just have to be eLearning. It could be performance support or a cheat sheet. Another alternative would be performance tracking or real time evaluation tool. Since with xAPI we would not be tied to just “Bill passed this course and got 85%” it opens us up to the full spectrum. We can go from onboarding to training to performance. It also gives us options with delivery. We can still use the browser, but we aren’t tied to it. We can also use an app. If by app, you build the xAPI hooks into it. That would provide the ability to keep records offline if necessary and sync when possible. You can test out an example of a performance support option using the links below. We did not create this, it is a proof of concept created by Advanced Distributed Learning (ADL) and made freely available. You can test it out yourself by downloading and installing it to your own web server. First you will want to create a free account on ADL’s sample Learning Record Store (LRS). Then you can download the files and directions off GitHub. To see the results after you install it and test it, use the ADL Statement Viewer. A hybrid approach is another option. In this case, the course is delivered via a SCORM based system, recording data in a LMS and through xAPI into a LRS or other system. This works because xAPI assumes that in many cases it will be part of the larger system, like a HR database or Talent Management System. The advantage would be that not only would you get all the data SCORM records but possibly additional data as well. There would be the ability to report on trends both with a single learner, a group, or a course. A sample of this type of implementation is available from ADL and is called Dual Tracking. Click the link to learn more. Another alternative along these lines would be a tool like JCA Solutions xAPI Bridge. This product is for situations where you need to track experiences that only xAPI can track, yet you need the LMS to be in charge of the data reporting. The promise of mobile learning is still there. In fact, with the flexibility of utilizing any of these three options, the future may be looking brighter than ever before. Confused by all these options or unsure of where to start? Contact JCA Solutions today for a consultation!